Over Christmas, the iconic magical nanny returned to cinema screens for the first time in more than 50 years. Emily Blunt took over from Julie Andrews as the title character of Mary Poppins Returns, arriving back in London to take care of the Banks’ children. 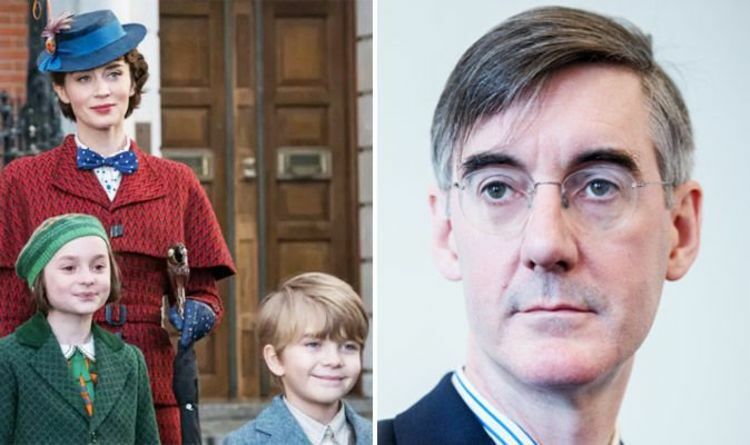 While a nanny for an aristocratic family may seem a rather old-fashioned part of family life for most modern audiences, it’s certainly not for Brexiteer MP Jacob Rees-Mogg. The 49-year-old was raised by his family’s nanny, Veronica Crook, who now takes care of his six children at their Westminster mansion. So what’s the connection with Mary Poppins Returns exactly? Well during the film, there’s a scene where the nanny is walking along a posh Georgian street in Westminster, alongside chimney sweep pal Bert and the Banks’ children on a bicycle. Well, it turns out the fictional nanny was walking down the exact same street where Rees-Mogg and England’s most famous nanny lives. No doubt this wasn’t on purpose since this part of Westminster and the surrounding streets are often used for setting historical dramas. She said: “In terms of pay and conditions, I am very satisfied. “It’s much more intrusive than when I first worked for the family. “Jacob does take his children to political things but this wasn’t a political event.